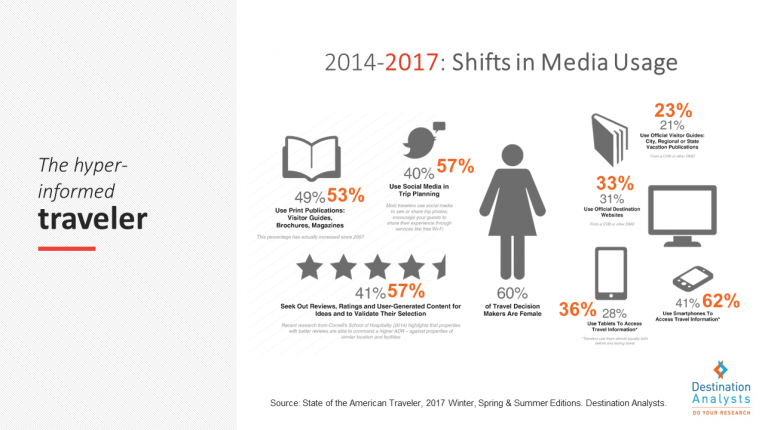 Print usage by U.S. travelers remains at near record levels in 2017 (see our recent white paper, “The Value of Print”), but there has been a bewildering explosion in the types of digital media that travelers are accessing. Usage of all media types, both print and digital, are up sharply in the last few years. See below. Online, the Hyper-Informed Traveler is, to steal a Star Trek phrase, in hyper drive. The rise of mobile at the center of the travel experience has spawned the Micro-Moment, described by Google as hundreds of short interactions with content by users on their smartphone. This has seen an exploding number of tourism-related website visits that travelers are taking before booking. Expedia’s most recent The Path to Purchase research in the U.S., Canada and the UK showed a staggering 121-plus website visits by the average visitor to travel-related website before making a booking. See below. Now more important than ever, content delivered to the Hyper-Informed Traveler should be optimized, relevant and specific to their individual interests and needs. Messages, content and campaigns to the Hyper-Informed Traveler needs to be delivered across a complex range of media and channels, both online and offline. Work with marketing partners who can offer this. In this multimedia environment, creative, content and campaigns need to be planned from the start to be cross media and cross channel – with content taking advantage of the unique characteristics of each platform. In short, focus on metrics that matter. Measuring which of these channels, media and creative drive real engagement, interest and active travel planning has never been more important. Have precise goals (we call them Signals of Intent to Travel or SITs) against which to measure success.